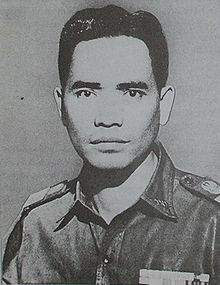 Maj. Gen. Donald Isaac Panjaitan posthumously born in Balige, Tapanuli, June 9, 1925. Formal education starting from elementary school, junior high school and then entered, and the last in high school. When he graduated from high school, Indonesia is in the occupation of Japan. So when he entered a military training should Gyugun. Completed training, he was assigned as a member Gyugun in Pekanbaru, Riau to Indonesia proclaimed its independence. When Indonesia gained independence already, he and other young men formed People's Security Army (TKR), which later became the TNI. In TKR, he was first assigned to the battalion commander, then became commander of Education Division IX / Bull in Singapore in 1948. Went on to become Chief of the General Staff IV (Supplay) Army Commandments Sumatra. And when the Dutch forces army of Into Aggression II, he was appointed Chairman of the Emergency Government Procurement Struggle Republic of Indonesia (PDRI). Along with the end of the Dutch Military Aggression II, Indonesia was recognized sovereignty. Panjaitan himself later became Chief of Staff of the Army and Territory Operations (T & T) I Bukit Barisan in Medan. Then moved back to Palembang became Chief of Staff of T & T II / Sriwijaya. After attending the course the Military Attaché (Milat) in 1956, he was assigned as military attache RI in Bonn, West Germany. When his term ended as military attache, he returned to Indonesia. But not long after that in 1962, officers who had studied at Associated Command and General Staff College, the United States, was appointed Assistant IV Minister / Commander of the Army (Men / Army Commander). Adopting this position the last time the event G 30 / S PKI happen. achievement for successfully dismantle a secret shipment of weapons from the People's Republic of China (PRC) to the PKI. From there it is known that the weapons are put into crates of building materials that will be used in the construction of buildings Conefo (Conference of the New Emerging Forces). Weapons are necessary PKI swing made preparations waging an insurgency. In the early hours of October 1, 1965, a group of members of the 30 September Movement left the Crocodile Hole towards the outskirts of Jakarta. They broke the fence in Jalan Panjaitan Hasanudin, Kebayoran Baru, South Jakarta, and then shot and killed one of the waiters who were sleeping on the ground floor of two-story house and called Panjaitan to come down. Two young men are Albert Naiborhu and Viktor Naiborhu seriously injured during a fight when DI Panjaitan kidnapped, not long after Albert died. Once the attacker threatened her family, Panjaitan down. He then tried to escape and was shot dead. his body was put in a truck and taken back to the movement's headquarters at Crocodile Hole. Then, the body and those of his colleagues were killed in an old well hidden. The bodies discovered on October 4, and all were given a state funeral the following day. Panjaitan gets posthumous promotion to Major General and given the title Hero of the Revolution.